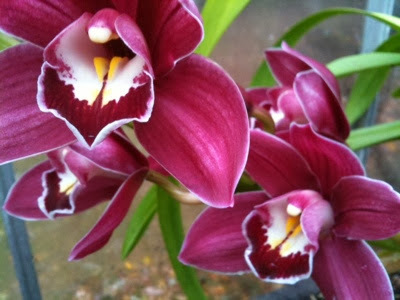 My Orchid Warrior...an un-named burgundy Cymbidium...is absolutely amazing. It has sent out five HUGE flower spikes this year. I put off a transplant until it is done. Last year I put a branch into the cedar and holly bouquets I made for the store. It looked wonderful. This years will be even better. This orchid was a gift from my husband years ago. It is indestructable and flowers on cue. Thank you Allan. Wish I had your green thumb on that one! Mine is putting out long roots, a celedon green color, which look almost as beautiful as a bloom....NOT!! Smile...time to give it some orchid fertilizer. Your warrior is stunning and I like that name. I put mine on my shady bench along the back fence from about May to late October. That is what sets it up to flower for Christmas. It needs the cool nights. Been growing orchids off and on for nearly 40 years. That is the one thing I can do every year now....get a cymbidium to flower. Easy peasy.